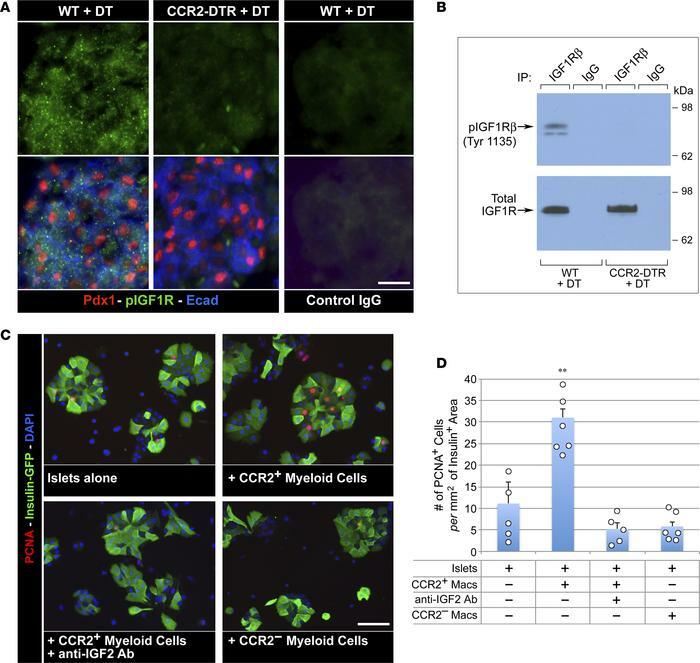 CCR2+ myeloid cells positively modulate IGF signaling in the pancreas. (A) Pancreatic sections of DT-treated WT and CCR2DTR/+ P10 mice stained for PDX1, pospho-IGF1Rβ, and E-cadherin or control IgGs. Note the diminished pospho-IGF1R-specific immunoreactivity in CCR2-depleted pancreas. (B) Western blot analysis of phosphorylated and total IGF1Rβ in whole pancreatic cell lysates from DT-treated WT and CCR2DTR/WT P10 mice. Representative of n = 3 experiments. (C and D) Immunostaining and morphometric analysis of proliferating PCNA+ β cells in the indicated islets/myeloid cells cocultures. CCR2+ and CCR2– myeloid cells used in these cultures were obtained by cell sorting from P1 pancreas (mean ± SEM of 5 microscopic fields, n = 2). **P < 0.01, ANOVA followed by Kruskal-Wallis post-hoc test. Scale bars: 20 μm.